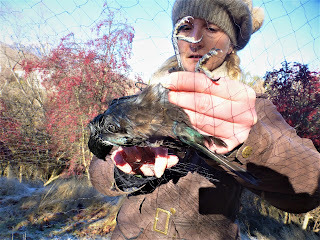 Rachel came over again this morning for some more banding experience and, she got some. It was a very frosty start with a temperature starting off about -8. We didn't start banding until around 9.30 with the sun starting to get the temperature in postive figures, but not by much. The Greenfinch, the first for a while, was a young female. Silvereye - 24 (25) there appears to be heaps about at the moment. We probably caught at least 10 twice making us even busier but all good experiance. Tui - 1 (0) when I unexpectedly caught the first Tui here a couple of years ago I thought there was a maximum of 6 birds. How wrong I was, 76 have now been banded and still they come. Although the Tui was a young female it could still get a good grasp with its tallons. I had a couple of nets up for a while this morning. The session was curtailed a bit as I was shouted lunch in Arrowtown and it was well worth it. Chaffinch - 4 (2) one of the recaps was banded on the third day of banding here and at 658 days from banding is now the oldest bird of any species beating the Silvereye caught on Monday by 7 days. The old Chaffinch, note the frost on the ground - it was a cracker. We drove down from Christchurch on Saturday and were probably luck to get here. It started to snow just after going over Burkes Pass and by the time we got to Tekepo it was snowing heavily with a considerably amount accumulating. We decided to continue our journey and got through OK. Apparently the road was closed shortly after we went through Tekapo and stayed closed until the next day. 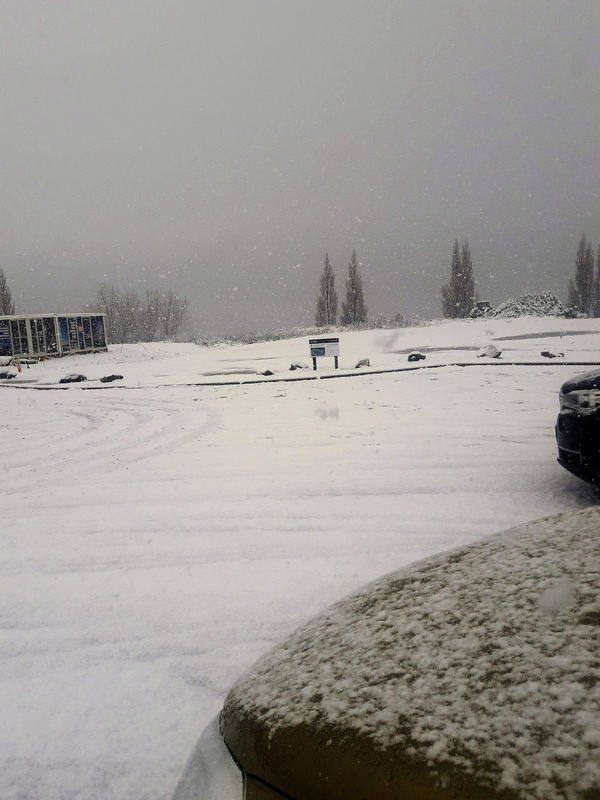 The snow in Tekapo as we went through. Have had two banding sessions since arriving here. On Sunday afternoon I put a couple of nets up in an effort to catch some of the flock of Chaffinch that were feeding under some trees. Not very successful with a catch of 9 birds and only 2 Chaffinch but did catch a new Tui which was a bonus. 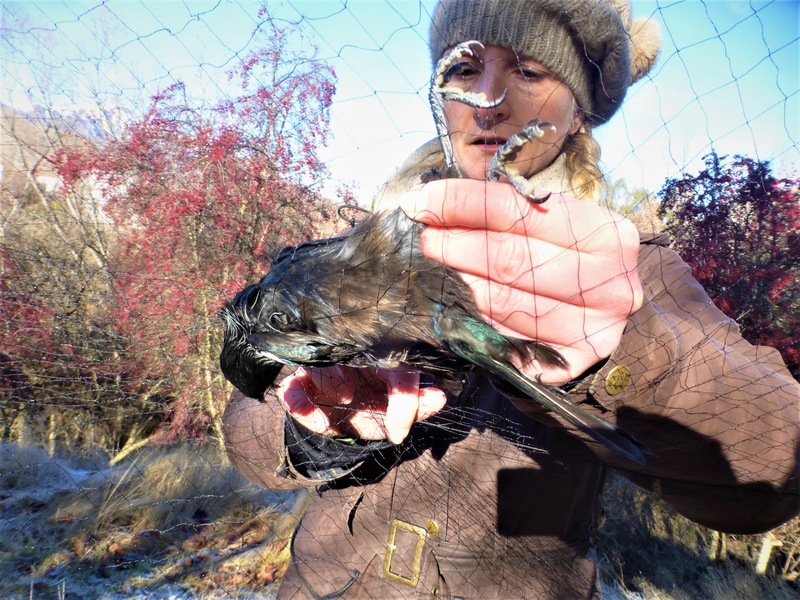 The Tui, an adult male waiting to be extracted from the net. 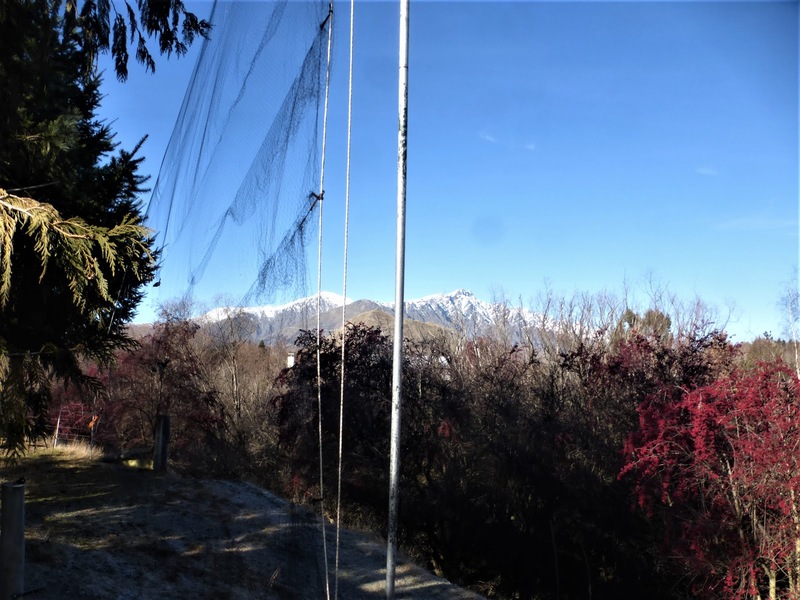 Yesterday, (Monday) Rachel came over from Lake Hawea and joined me. We managed to catch 53 birds with 29 new and 24 recaps. The catch was dominated by Silvereye, especially recaptures, with a few House Sparrows and a sprinkling of others. The Goldfinch was a hansome adult male. House Sparrow - 11 (0) Rather surprised not to recapture any of the 750 birds banded in the last few years. Silvereye - 17 (26) A considerable number of the recaps were banded in the neighbour's orchard. The oldest recap was banded in Sept 15 about a week after banding started here. at 651 days from banding it is not only the oldest Silvereye but the oldest bird of any species recaptured here. Bellbird - 1 (1) both were females which is almost unique with males usually dominating.